The 2018 elections are over and the next legislative session convenes on Friday, January 4, 2019. The constitution, legislative rules, and a looming 120-day legislative session do not allow new and returning legislators much time for rest and relaxation between the November election and the January session. 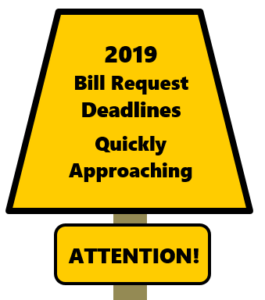 Bill deadlines require legislators to complete the bulk of bill drafting in December and well before the first day of the legislative session. * And this year, due to the earlier convening date (See “Surprise! The 2019 Legislative Session Convening a Week Earlier”, posted September 20, 2018,) all bill deadlines are earlier than normal! Returning legislators have until Monday, November 26, 2018, to submit their first three bill requests to the Office of Legislative Legal Services (OLLS). Newly elected legislators have a little more time — but not much — to get their session legs. They must submit their first three bill requests to the OLLS by Monday, December 10, 2018. Legislators who have already submitted bill requests, or those who do so as soon as possible, allow drafters to start crafting their bill drafts earlier, which can subsequently help identify and fix many drafting issues long before the first day of session. When submitting bill requests on deadline dates, legislators should be prepared to provide sufficient drafting information so that the drafters can immediately start drafting. The legislator will also need to decide which of these requests will be filed by Friday, December 28, 2018 for introduction on the first day of session. And for newly elected legislators, keep in mind that although the legislative rules allow you more time to submit your first three bill requests than a returning legislator, these rules do not give you, as a new legislator, more time to have your bills drafted. You will actually have less time for bill drafting! If possible, every legislator — even new ones — should try to submit at least one bill request ASAP. Don’t worry about having all the information or all the answers at this point. The bill drafting process allows for bill drafters to ask questions and help you find information. The drafting process can also allow potential issues or problems to rise to the surface making it easier for the legislator to decide whether his or her idea is “workable.” If it becomes apparent that a request isn’t working, the legislator may be able to withdraw it and replace it with a new request, as long as he or she makes that decision on or before the November 26 deadline for returning members or the December 10 deadline for new members. Legislators should consider submitting more than the minimum three requests by the earlier request deadline. By doing so, a legislator may preserve the flexibility to withdraw and replace at least one of his or her requests after the early request deadline without losing a request. For example, if a legislator submits only three requests by the early deadline and later withdraws one of them, the legislator forfeits the withdrawn bill request because the joint rules allow a legislator to make only two bill requests after the November 26 or December 10 deadline, whichever is appropriate, and before the January 10 request deadline. On the other hand, if a legislator submits four bill requests by the earlier request deadline and later withdraws one of them, the legislator still retains his or her three bill requests that met the early request deadline. In addition, the legislator still can submit the two requests that are allowed after the early bill request deadline — for a total of five bill requests. * This year every legislator’s first bill must be filed by Friday, December 28, 2018, to be ready for introduction on the first day of the legislative session. Every Senator’s next two early bills must be ready for introduction by the 5th legislative day (Tuesday, January 8), and every Representative’s next two early bills must be ready for introduction by the 8th legislative day (Friday, January 11).